In this class you will learn how to use an oscilloscope to trigger, decode and confirm the PHY-Layer signal integrity of automotive buses with a focus on CAN, CAN FD and I2C data buses. Confirm each u’controller’s PHY-layer operation. Identify location of error frames. Integrating dbc files to perform symbolic triggering and decoding. extracting/plotting embedded CAN data for pass/fail testing. 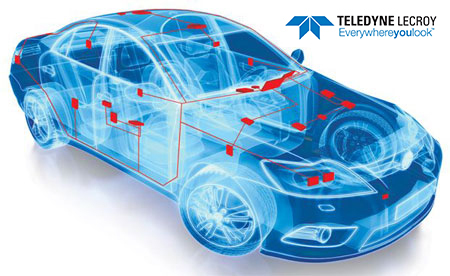 We will also briefly introduce compliance test procedures for BroadR-Reach - Automotive Ethernet. This will be a workshop with hands on time to apply what you have learned. New Hardware and software technicians and engineers probing electrical signals on the Automotive Bus and those that are trying to understand capabilities of todays testing.